1,001 opportunities to hone your Praxis test-taking skills So, you're an aspiring teacher with your sights set on educating students. Good for you! Teaching is a noble profession, and it's quite a competitive one too. Each year, over 600,000 prospective educators take the Praxis exams but not all of them will come out of these standardized tests with their certifications in tow. If you're wonderin… g how you can up the ante and ensure you gain the credentials to score that coveted spot at the front of the classroom, the answer is a practice question away! 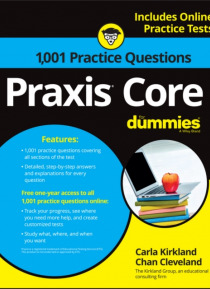 1,001 Praxis Core Practice Questions For Dummies goes beyond the instruction offered in typical study guides, offering more than a thousand practice opportunities for you to test and assess your understanding of what you can expect to encounter on the actual exam. Complemented with detailed, step-by-step solutions, each practice Praxis Core question gives you a leg up on the competition to earn your hard-earned position as the future's next great educator! Increase your chances of scoring higher on the Praxis Core exam Test your skills with practice problems for every question type Access practice problems online, from easy to hard Track your progress, pinpoint your strengths, and work through your weaknesses Practice your way to Praxis test-taking perfection! Free one-year access to all 1,001 practice questions online.